A modified U.S. nuclear bomb currently under design will have improved military capabilities compared with older weapons and increase the targeting capability of NATO’s nuclear arsenal. 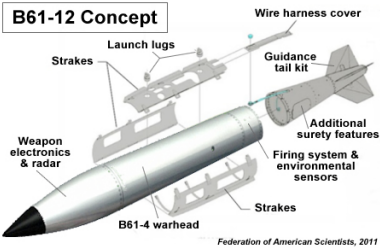 The B61-12, the product of a planned 30-year life extension and consolidation of four existing versions of the B61 into one, will be equipped with a new guidance system to increase its accuracy. As a result, the U.S. non-strategic nuclear bombs currently deployed in five European countries will return to Europe as a life-extended version in 2018 with an enhanced capability targets.